Early primary or grammar education consisted of a series of one room school houses, dating back to the year 1800. They were the standard for children to learn the needed skills to ensure their success to adulthood. The first teaching certificate issued at Port Byron was issued to Celestia King in 1854, a granddaughter of Philip King. She boarded at various homes to teach for $1.50 a week. An article by Richard T King in 1952 indicates that within the village, there were two separate school districts, one located at the corner of Rochester and King Streets, and the second at Pine Street. His article indicates the Port Byron Free and Academy opened in 1852, with Ceylon Otis as its first Principal and academic departments under the management of T. K. Fuller. The first Board of Education included Dr. James D. Button-President, William A. Halsey- Secretary, Alfred Mead, George Randall, A.K. King, William D. Osborn, Finlay M. King, George Hayden, and John C. Foster. 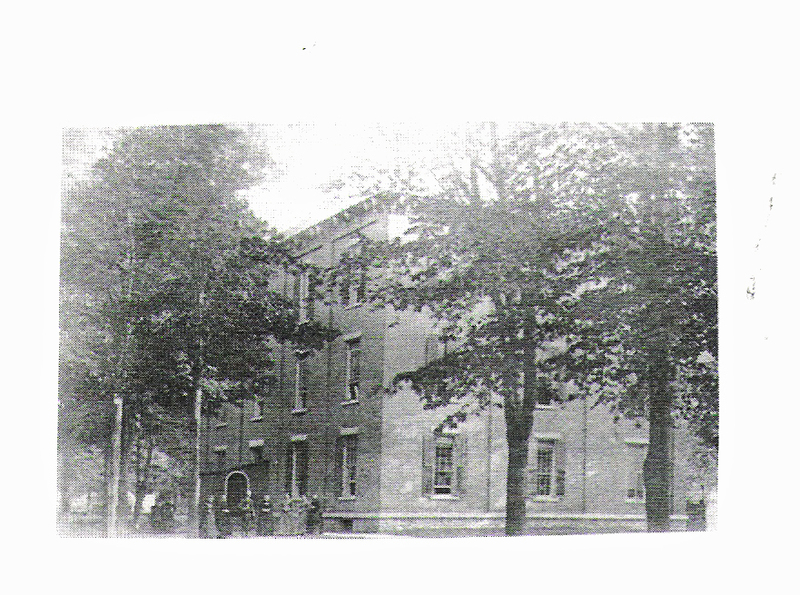 The district was chartered on April 7, 1857 and would be called the The Port Byron Free School District. The following year, a lot was purchased on Church Street. The cost of the lot and building amounted to $10,850.00, which has the purchase power of about $292,000.00 today (based on 2009 Consumer Price Index). The building would be called the Port Byron Free & Academy. They were established with the State Board of Regents under Chapter 298, Laws of 1859. The building was three stories, and measured sixty feet long and fifty feet wide to accommodate 400 students. The building was heated by coal stoves. There were two entrances, one for boys and the other to be used by the girls with genders separated inside the class room. The first floor held classes for grades 1-4; the second floor was used for grades 5-8 and the high school occupied the third floor. The faculty consisted of six teachers. Despite the name Free in the school district name, enrollment was not free for all students. Pupils outside the village had to pay tuition of $4.00 per term (would be about $108.00 today) with extra fees for classes in Latin, Greek, German, French and Bookkeeping. Tuition increased to $5.00 per term by the 1890's. The school year consisted of three terms, with many of the boys only attending the winter term due to commitments at home and the needs of the family farms. Many of the students walked to school, some traveling several miles. Classes started at 9:00 AM which included prayer and ended at 3:30 PM. There was no physical education classes but calisthenics was included in the daily routine. Others to serve as Principal included Dr. W.S. Aumock who was Principle in 1876, having come here from the Franklin Academy in Malone. Albert W. Morehouse served as Principal but left in 1888 to accept a position for the Normal School at Potsdam. The first graduating Class was produced in 1872 with only one student, being Louis Brown Root. According to Richard T King, the first academic diplomas issued at the school by the New York State Regents was in the year 1878, which was issued to Joseph E Sweet. Commencement exercises were held at local churches being rotated between the Methodist and Presbyterian Church. This was because the school did not have an auditorium. According to the Vandetto sisters, the Board of Education would make a change to the District name in 1897, changing the name to Port Byron Union School and Academy. However, there are newspaper articles in 1876 that refer to our school by this name for relief of taxes in the NYS Senate. The alumni gathered for a reunion and banquet on July 20, 1880 at the Cayuga Lake Hotel. The Port Byron Free Academy was one of only a few places that offered secondary education in our region. It burned down in November 1898. Classes continued between the Fire Hall and area church basements until another school could be built at the same location on Church Street. The next school would be built on Church St. in 1899, being called the Port Byron High School.